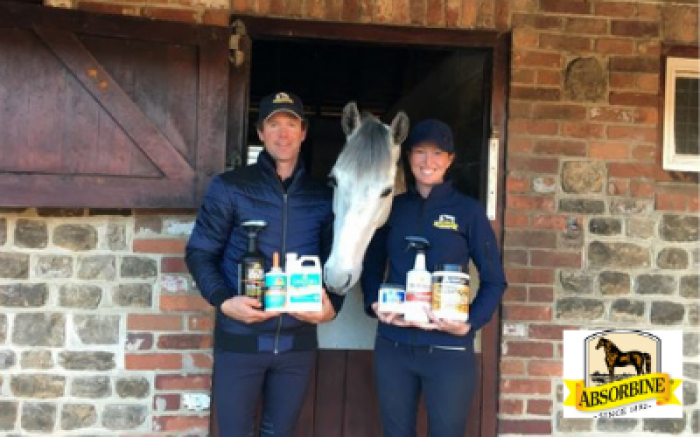 British Grooms Assocation and Equestrian Employers Association sponsors Absorbine are delighted to announce their partnership renewal with international event riders, Emma and Kevin McNab. Having relocated from their native Australia in late 2011, the husband and wife team have been based in Surrey, since 2014. With the eventing season now in full swing, Kevin has a busy season ahead of him, with 17 horses to compete throughout the summer. With a win at Aston Le Walls on 2nd March marking the team’s first outing, the future is looking bright. His first CCI4*-S event will be marked by Sopot in Poland in April, where he will be competing two of his top horses, Willunga and Scuderia 1918 Don Quidam, the latter of whom Kevin is hoping to qualify for a 5*. Willunga is set to head to another 4* later in the season, in order to qualify for the 2020 Olympic Games in Tokyo. With the imminent arrival of their first child in August, Emma will continue to ride but plans to leave the competitions to Kevin – for now! Her aim is very much focused however, on competing at a 4* in October, in order to qualify her horse Fernhill Tabasco, for Tokyo. With a yard busier than ever and hugely exciting times ahead, the McNab Eventing is set to reach new heights this season. “We are delighted to renew our sponsorship of the McNabs, not only to watch them compete with current partnerships but to see the progression of their younger horses, as they rise through the ranks. With Toyoko set firmly on the agenda for the pair next year, it’s a very exciting time to be involved with McNab Eventing and have them as part of Team Absorbine”.